How will the media attribution guide help me and my business? Our research shows that many businesses are still using the Default 'last click wins' attribution method in Google Analytics or their web analytics tool. We think that the reasons behind this are a combination of lack of knowledge of why you need to look at attribution, its apparent complexity and not knowing where to look to find the answers. Hugh Gage of Engage Digital is the Smart Insights Expert commentator on Digital Analytics. He is the author of our premium member guide to Tag management. Hugh has worked in digital communications since 1994, switching from roles in media where he was Head of Online Planning and Buying at Manning Gottlieb OMD, to senior analyst at Logan Tod now part of PwC. He was one of the first to hold the Google Analytics Individual Qualification and is also a DAA Certified Analyst. You can follow him on Twitter or connect on LinkedIn. 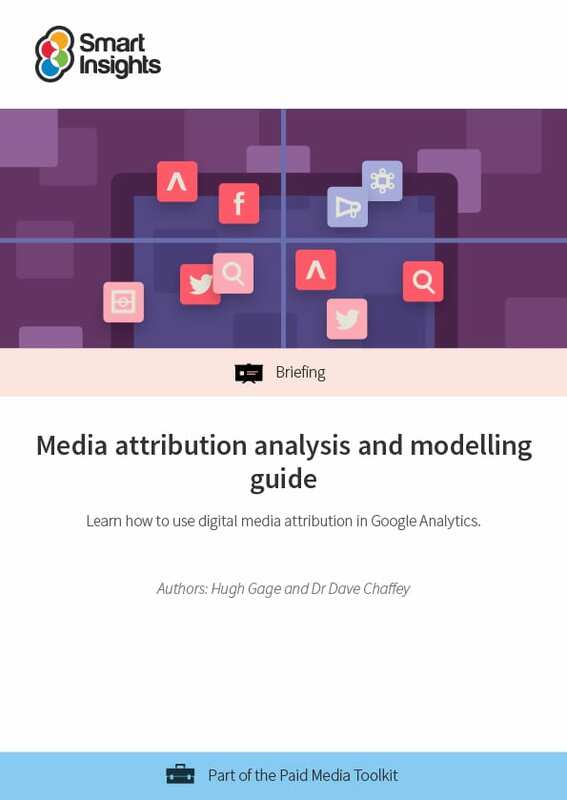 Who is the media attribution and modelling guide for? Client side Marketers looking to build more advanced attribution models to better track their campaigns. Consultants charged with implementing attribution models for their clients. Ecommerce marketing managers looking at how better to track the success of different campaigns and on-site features. Individual and Business members get full access to this and 9 other guides in the Paid media Toolkit.